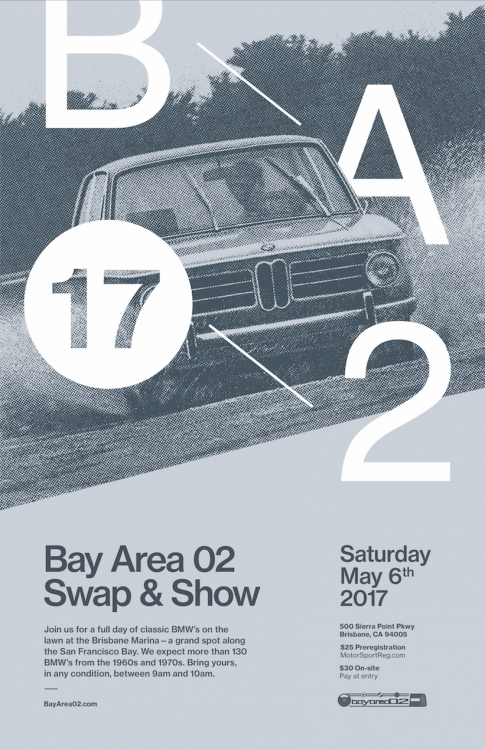 Swap & Show 2017 on 6 May in Brisbane Calif.
BayArea 02 Swap & Show, 6 May 2017, Brisbane, California Marina. Preregister on Motorsportreg (watch this site for a link). Preregistration is $25 while the on-site fee on 6 May will be $30. Graphic artist Kile Brekke is again designing our T-shirts and printed materials— his designs are quite popular among our 02 groups! Please preregister early so we can more easily determine the shirt sizes to order. We will have a named bag for each preregistrant so our closing date is earlier than some years past in order to organize the bags. Note— Swap & Show visitors are welcome! If you do not show your car or swap parts, there is no fee for entry. But we encourage anyone with a BMW of our vintage to bring your car to display, no matter how beautiful your restoration or how mundane the dirt and rust on your daily driver (some photographers we know can make the rust and dirt very photogenic— check out some photos from previous years!). Swap & Show does not judge your car so there will be no points for extra dirt, missing dirt, matching luggage or concours shine. 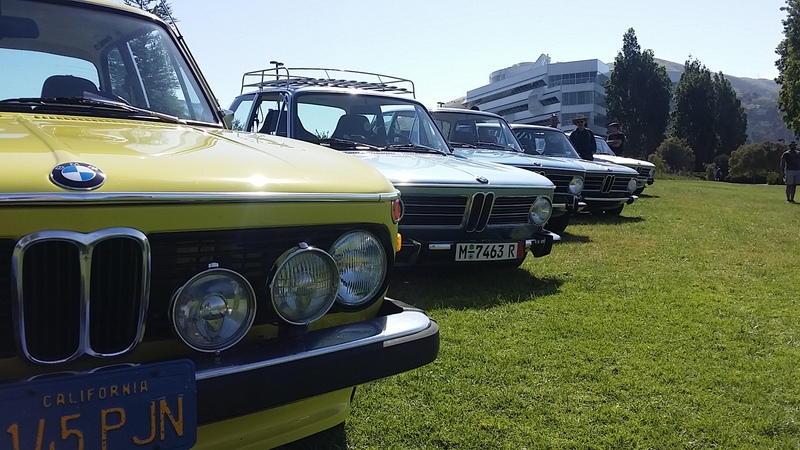 We smile at all BMW's, and photographs or videos are welcome! To register, go to [www.bayarea02.com] and follow the link or go directly to[MotorsportReg pre-registration for Swap & Show 17 on 6 May 2017]. Some of you found this web location already; now everyone can! Any estimate when registration will open? All registered, flying out this time. Hoping for good weather. Is there a pre-thread for the event? A place where attendees post a wish list or share some of the things they'll be selling in advance? Not yet, might as well start a new thread to make it easier to follow. Awesome poster! Will those be sold at the event? Yes, what time do people begin arriving? Thanks for registering for the Bay Area 02 Swap & Show 17 on May 6, 2017 at the City of Brisbane Marina in Brisbane, California on the San Francisco Bay. Check-in for online registrants will be open from 9:00 am to 10:00 am. The show begins at 10:00 am and runs until 3:00 pm. If you have any questions about the event, please contact info@bayarea02.com. See you all Saturday! Been waiting ages. Hello everyone. My wife and I had a great time at our first Brisbane meet. It's so great to see and mingle with so many 02'. 3.0, and the other little BMW....enthusiasts. By the way, i think the little ones stole the show. Those owners have done a great job on those ....I would love to drive one. I had my red 02' parked all the way to the end. My was the one that was 'hit' in the front. It happened just before the show. For me was also very excited to joint the caravan from Northern Ca. About 12 cars. I missed then by 5 mins at the meet point, but caught up with them 10 miles from the show. I was able to get some parts for my car, both new and used. Also made some good local and long distance contacts. I'll have my 02' ready for next year's event.